This is a very old entry that I had kept. 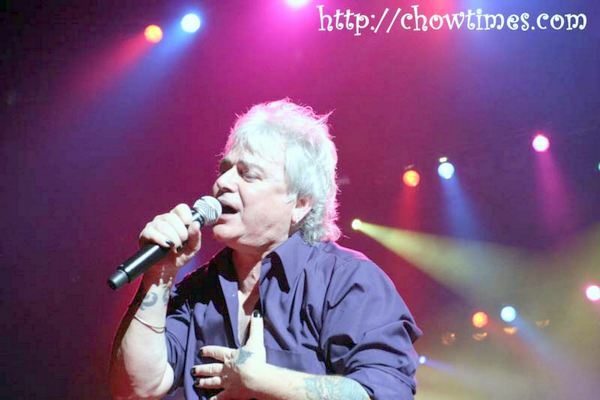 It’s not really about food but about one of our favourite singing duo — the Air Supply. The pictures I took came out so surprisingly well that I could not resist blogging about the concert. He he he … it does show our age, eh? Russell Hitchcock and Graham Russell came for a couple of days of performance in Vancouver sometime late last year. 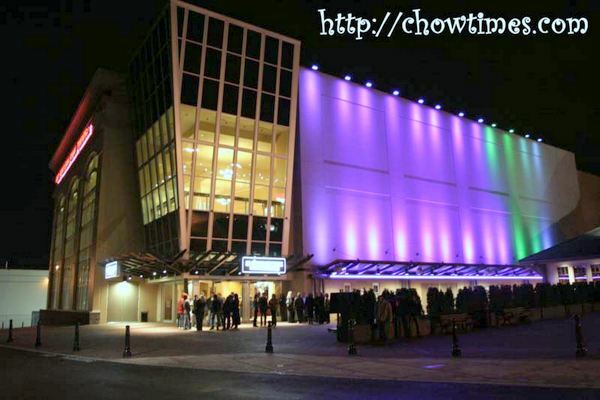 They performed in the Red Robinson Theatre in Coquitlam. Russell Hitchcock, the lead vocalist, does seem very much heavier and older than I had always pictured him to be. Still, he had not lost his high pitch voice. Some of our favourites were “Making Love Out of Nothing At All”, “Every Woman in The World”, “All Out of Love”, “Now and Forever”, “Just When I Thought I was Over You”, “Two Less Lonely People in The World” and “One More Chance”. 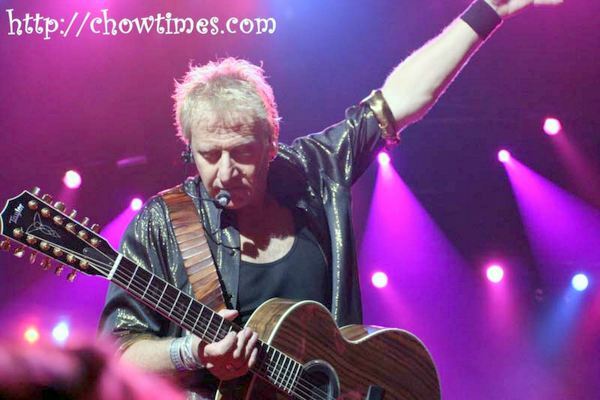 It was disappointing that Graham Russell lost his voice, especially towards the end of the concert. He did apologize and explained that he caught something on the plane to Vancouver and it got progressively worse. What a bummer but everyone seems to understand. It’s a good thing that it was Russell Hitchcock did most of the singing. Pineapple is native to Brazil and central America, but is now a favorite crop in tropical and subtropical climates. Pineapple is a good source of manganese, as well as containing significant amounts of Vitamin C and B1. 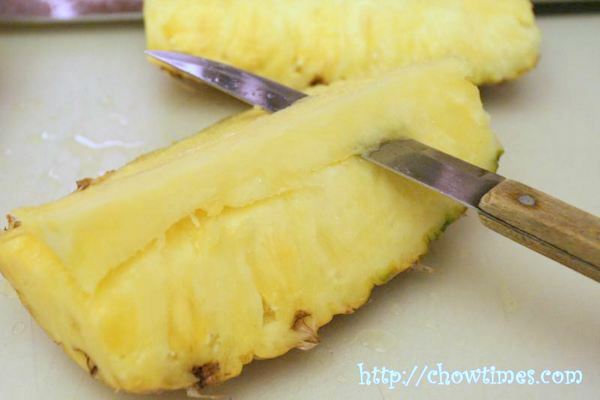 Pineapple makes an excellent marinade and tenderizer because it contains bromeline, an enzyme that digests protein. The enzyme also keeps gelatin from setting, so pineapple is not good for fruit jellies. I love pineapple but I seldom buy a whole pineapple. This is because I’m intimidated by the task of cutting up a pineapple. There are lots of so called eyes on the pineapple which need to be removed. I guessed the exporter of pineapples are aware of this and nowadays, you’ll find a little brochure attached with the pineapple illustrating how to cut up a pineapple. 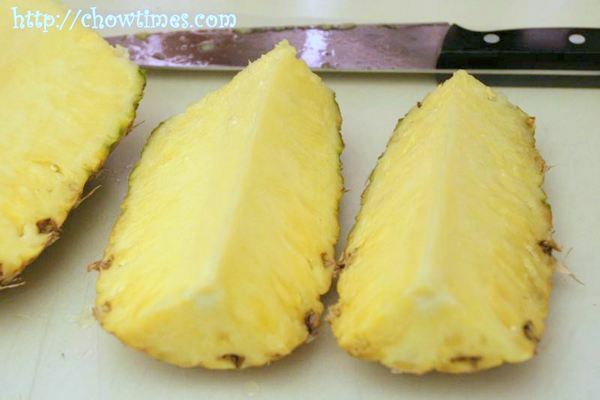 First, you remove the top and bottom of the pineapple. 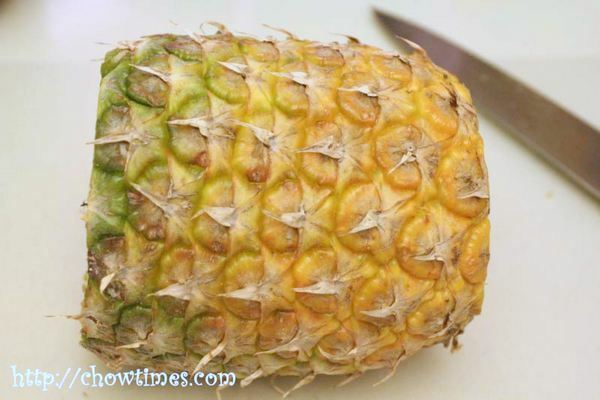 Then, you stand the pineapple up on the flat bottom and cut the pineapple into quarters. Remove the core which is too fibrous to eat. During Chinese New Year, tangerine is the official fruit. Every Chinese family will surely have tangerines. Tangerine in Cantonese is ‘kum’ which has the same pronunciation as gold in Cantonese. So, tangerine is an auspicious fruit during this festive season. It is the Chinese customs to visit families and friends during the 15 days of Chinese New Year celebration. During such visits, the visitor will bring gifts which always include tangerines. 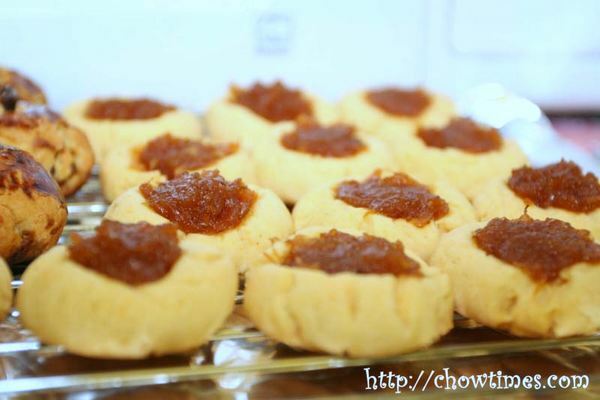 I saw this Tangerine Cookies in a recipe book which Ben brought back from Malaysia and its just perfect for Chinese New Year celebration. Unfortunately, the Tangerine Cookies did not turn out as pretty as those in the recipe book. I think its the temperature of the oven which caused the cookies to be slightly burn. Anyway, if you would like to try this recipe, I’ll recommend you lower the oven temperature. Since the first batch of the Tangerine Cookies did not turn out as I expected, I used the rest of the pastry to make Pineapple Tarts. 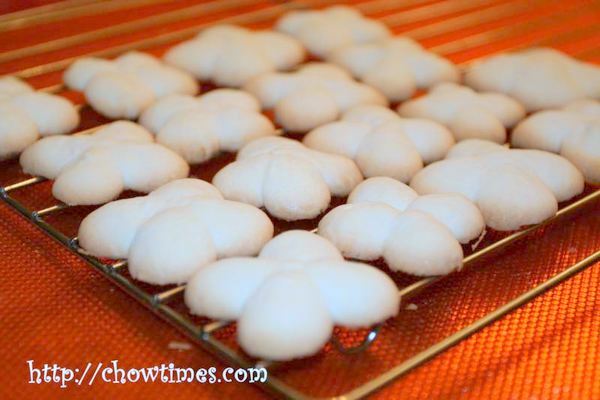 Actually its more to a Thump Print Pineapple Cookies because I do not have a pineapple tart cutter. The Pineapple Tart turned out pretty good. Of course, I bake them in lower temperature that the recipe book recommended. I have always love the tartness of the pineapple in a slightly sweet pastry cookie. 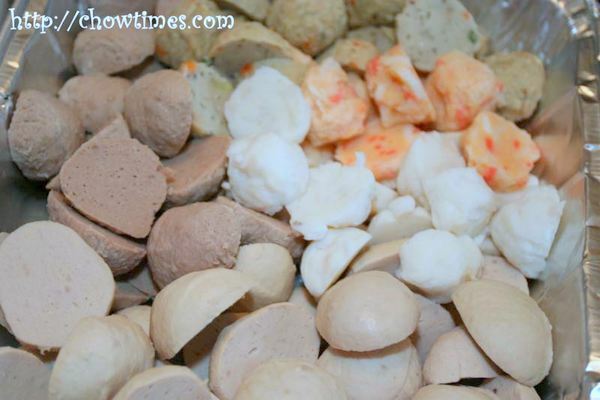 Kueh Bangkit is one of the traditional cookies served during Chinese New Year. 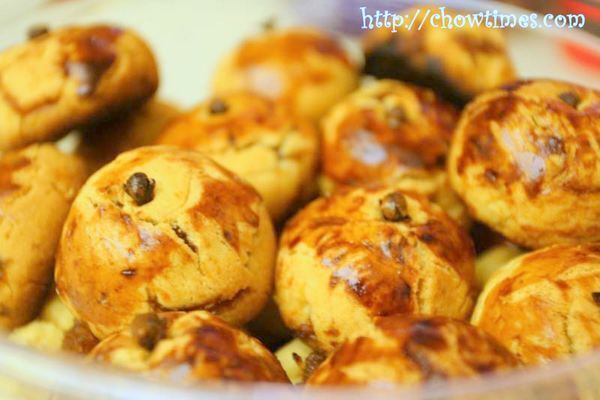 It is a very light and fragrant cookie that melts in your mouth. Traditionally, its made with a mold in the shape of little chick. I do not have such mold, so I tried to use my cookie press to make it. I was successful with the cookie press for the first batch of the Kueh Bangkit and ran into difficulty with the second batch. The dough just wont come out from the press. So, for the rest of the dough, I just shaped the dough into long strips and cut them into 2 cms strips for baking. I made a Cheesecake for dessert for the Chinese New Year Hotpot gathering. I love cheesecake but I have never try making one myself until recently. 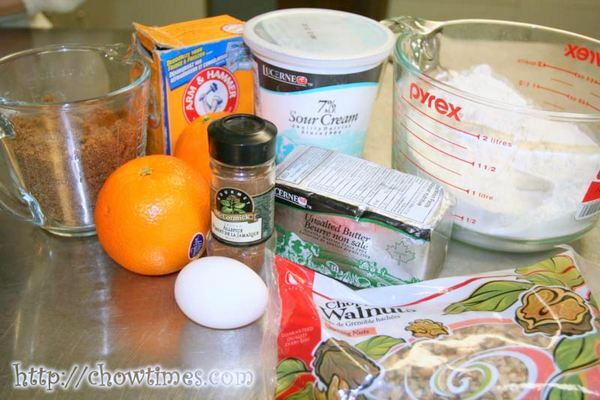 This recipe is adapted from Spices Corner with some minor adjustments to it. Thanks to Spices Corner for sharing the recipe. I made the adjustments because the cheesecake came out cracked the second time I made it. 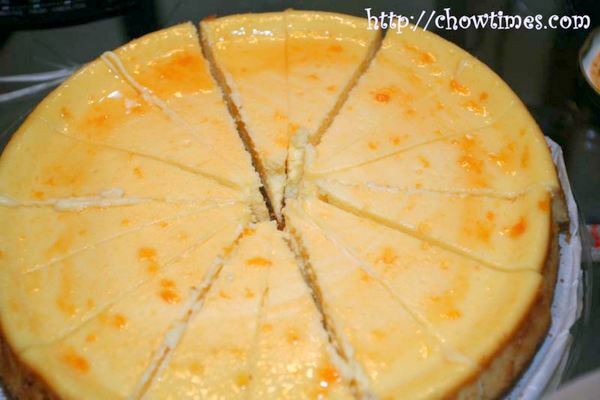 This cheesecake is a lighter version with the combination of cream cheese and sour cream. 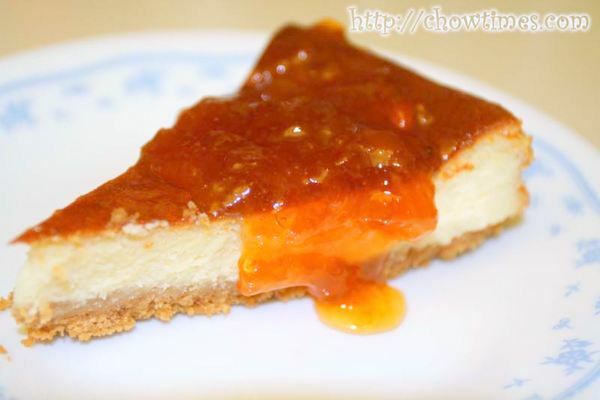 I glazed the cheesecake with apricot jam. 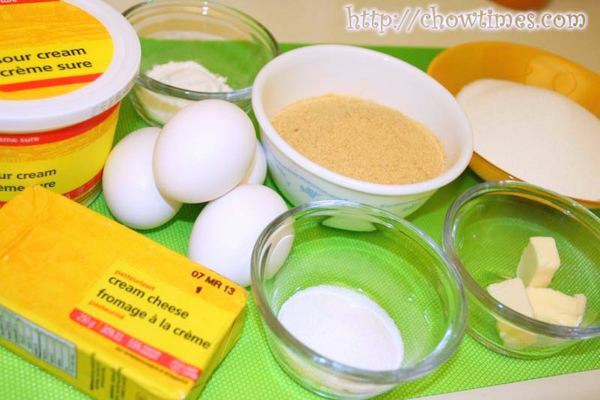 The photo below is my first attempt to make the cheesecake. It came out a bit too brown on top. I managed to get the right colour by covering the springform pan with a tin foil after 30 minutes of baking. I made this Asam Gai Choy as a side dish for the Chinese New Year Hotpot gathering. 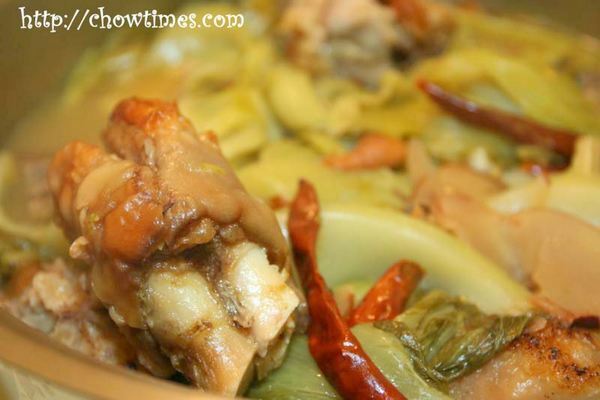 My late mom always made Asam Gai Choy or Kiam Chai Boey after a festive celebration. This dish is made with leftovers from a large meal. Asam Gai Choy is a sour and spicy dish. You can adjust the sourness and spiciness according to your preference. I love it very sour and spicy. This dish is great with steam rice and very appetizing. There are only a few key ingredients for this stew. Leftovers meat. 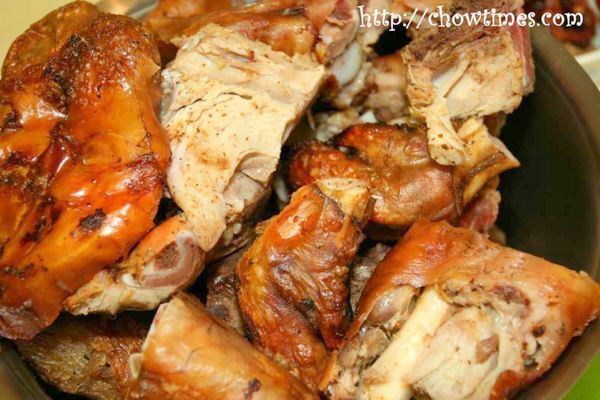 Instead of leftovers meat, I used roasted pig feet. You can get this from Chinese BBQ store at a relatively cheap price, usually $1 to $1.50 per feet. 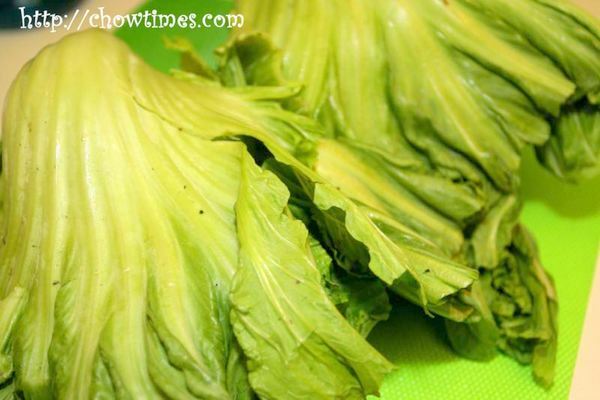 Gai Choy or mustard greens. Gai Choy is a pungent green and is usually cooked for a long period with pork on bone to absorb the flavor form the meat. Mustard greens are extremely high in Vitamin A and K.
Gai Choy comes in 2 types, big leaves and small leaves, They taste the same. I would prefer the small leaves if I can get them, save time on tearing up the big leaves. 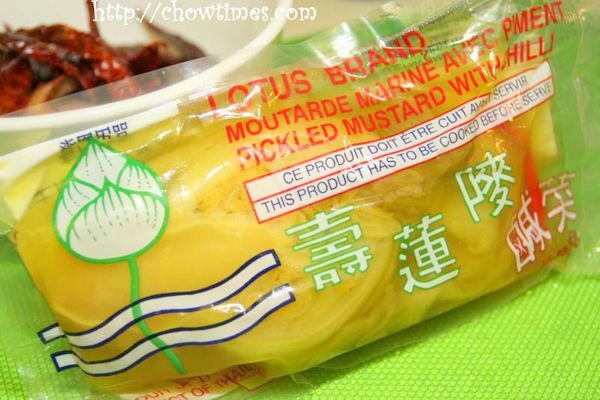 Pickled mustard. 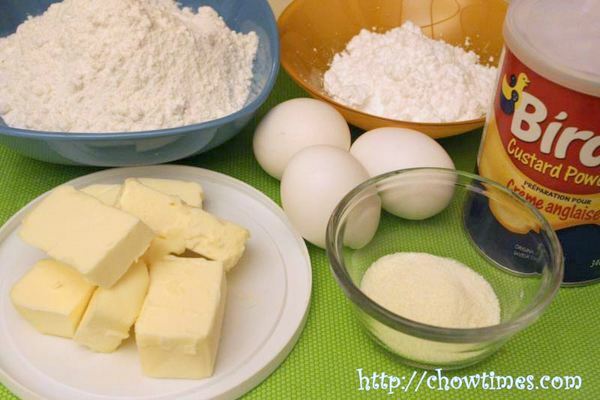 This will gives the dish the required saltiness without any addition of salt. 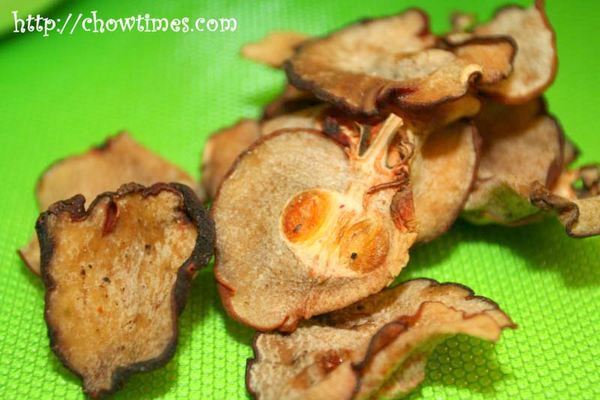 Asam pei or tamarind skin. It gives the dish the sourish flavour. 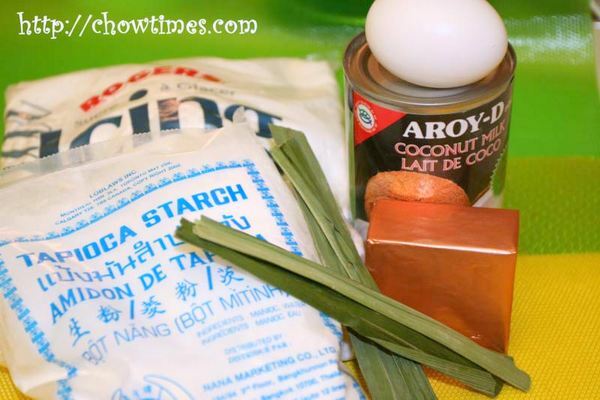 You may substitute with tamarind paste if the skin is not available. 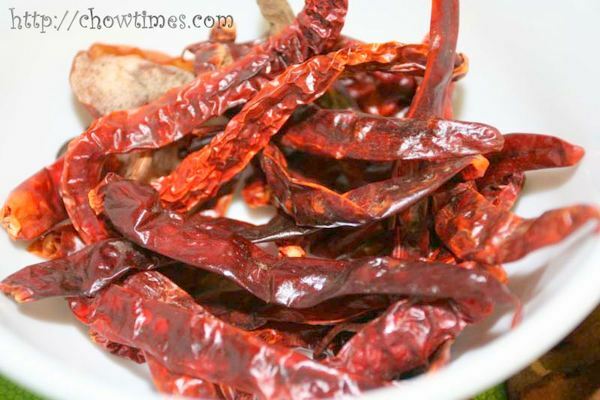 Dried chilies. The chillies give the dish the spiciness. If you are not Canadian, you probably have never heard of Caesar. Caesar, sometimes also known as Bloody Caesar, is a very Canadian cocktail. 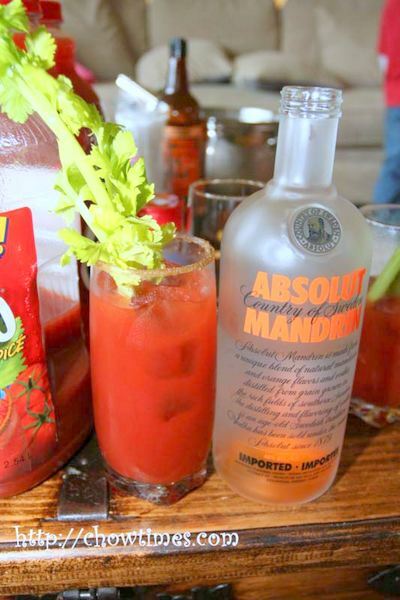 It is based off the popular Bloody Mary with a slight difference. Caesar is invented in Alberta. I have never known why this is called Caesar … anyone knows? The primary ingredients of the cocktail is Vodka and Clamato. During the Chinese New Year gathering, I offered to be in charge of making the cocktail. It was an easy choice to decide on Caesar. Firstly, it is all Canadian and secondly the redness of the cocktail is just perfect for the occasion. The color of the cocktail is Clamato, which is a blend of clam broth and tomato juice. It’s sounds like a weird combination but really, you taste more of the tomato juice than clam. 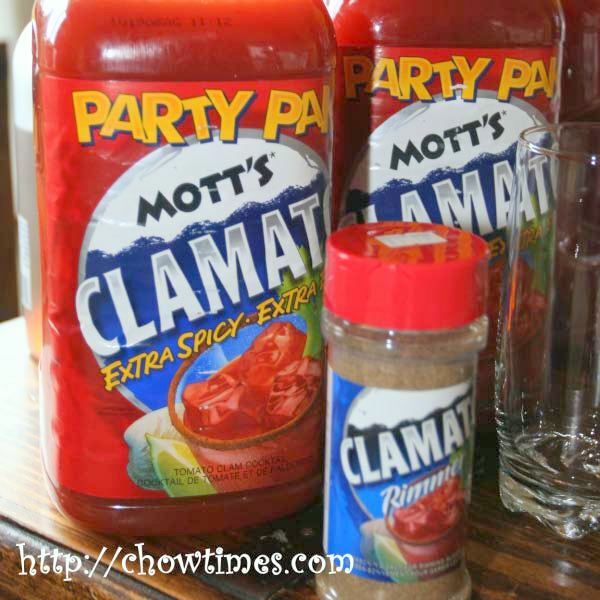 Ironically, the biggest manufacturer of Clamato is Mott’s which is an American company. Another thingy you need is some Celery Salt Rimmer. 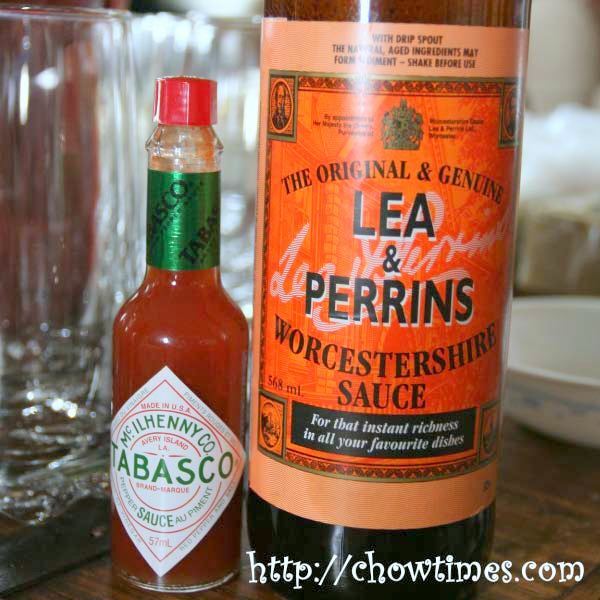 The other ingredients are some Worcestershire Sauce and some Tabasco. Believe it or not, we virtually ate non-stop for 5 hours after the Yee Sang. I had never been so full for as long as I remember. We just ate and chatted … and ate and chatted. The primary dish is the hotpot. Because of the number of people there, we had two separate hotpots going. 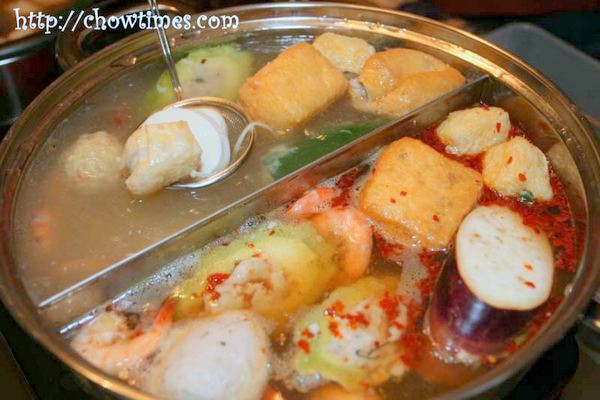 Hotpot is also known as Da Been Lo or Sang Woh in Cantonese. The best time to enjoy this is during the colder winter months. That is why at this time of the year, some of the Chinese grocery stores have sections dedicated only to hotpot ingredients. Hotpot is supposed to be enjoyed at a leisurely pace. It consists of a simmering pot of stock at the center of the dining table. While the hot pot is kept simmering, ingredients are placed into the pot and are cooked at the table. It’s popular these days to use a double pot with a centre divider to have two types of broth — one a normal chicken/pork broth and the other the ultra spicy Thai tomyam broth. Suanne and I were in charge of the “condiments” and sauces. We had once had hotpot in a restaurant in Richmond where they had available something like 15 sauces. So, we thought that we do the same too. 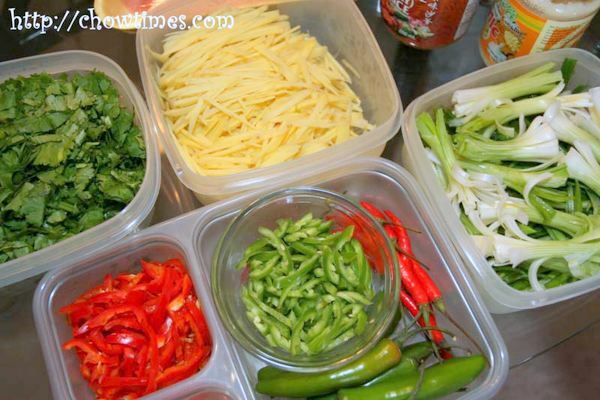 Here is what Suanne prepared: green onions, ginger, cilantro, and three different types of chilli peppers. 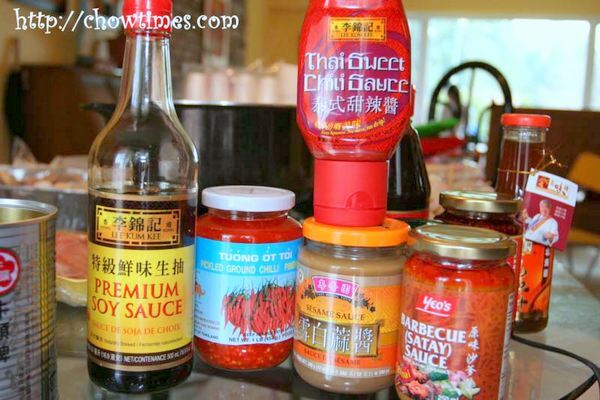 … soya sauce, pickled chilli sauce, Thai chilli sauce, sesame sauce and satay sauce. The best sauce is still the Sah Cha sauce. 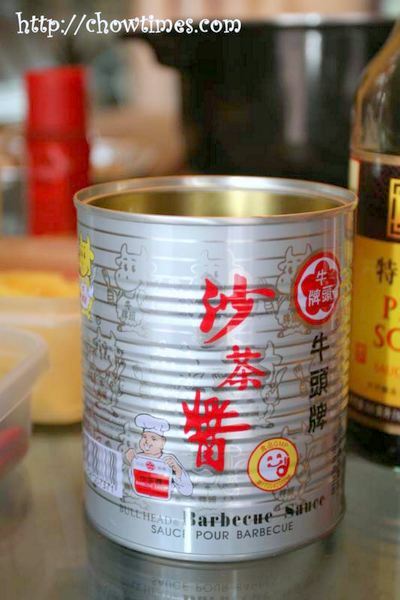 This is a popular hotpot sauce originated from Taiwan which is also known as Barbecue sauce. 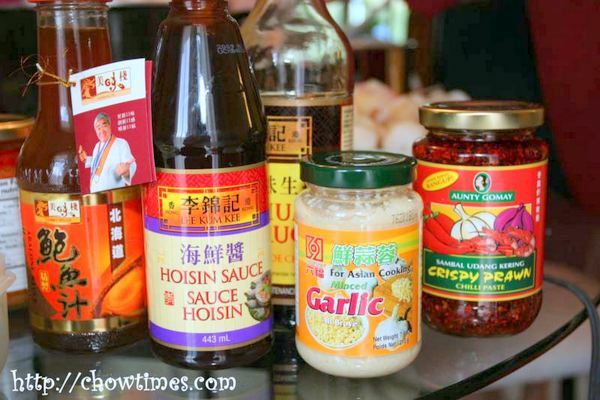 These sauces are meant to be used as a dip and is not something you add to the hotpot. I guess everyone just did not “get it” because the sauces and condiments went relatively untouched! Next time, I think I will do a demonstration first! There are also lots of meat balls of every kind … pork, beef, fish, prawns, squid and what nots. These are the only things that we can be sure the kids will eat. Polly and Vincent provided this, I believe. Prawns cooked very fast and adds a lot of flavor to the already flavorful broth. Yummy! 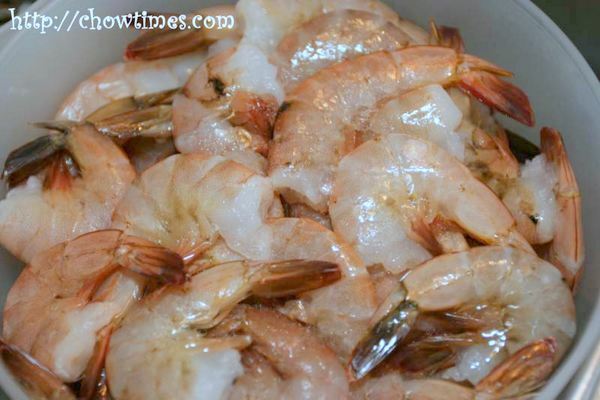 Prawns with the shell on will impart more flavor. Double Yummy! Peeling the shells is half the fun when you are sitting around the table chatting. Nice touch, Janice and Bernie. Check out our other Yee Sang post and video here. Eating Yee Sang in Malaysia and Singapore is a tradition every Chinese New Year. 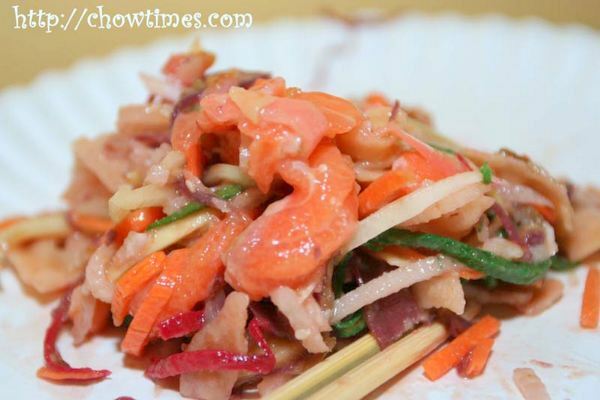 Yee Sang is basically a Chinese raw fish salad. Unlike Japanese, Chinese do not eat raw fish, preferring it cooked. However, this is the only Chinese dish which we know contains raw fish. However, I must add that this is a dish invented in Singapore and is popular only in Malaysia and Singapore. So, if you ask Chinese outside of Malaysia and Singapore, they will very likely not know what Yee Sang is. Half the fun in eating Yee Sang is by a communal tossing of the salad with chopsticks. 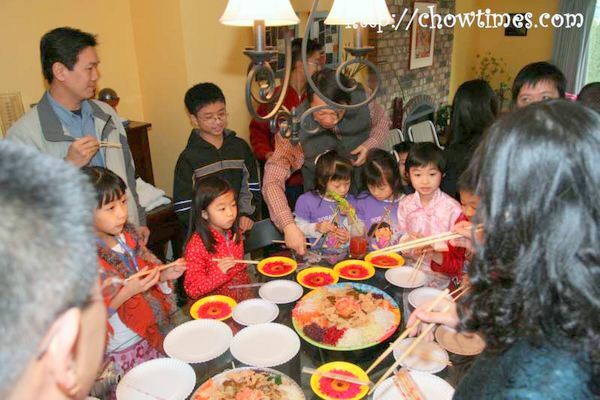 The action of tossing is known as Lo Hei which symbolizes increasing prosperity, abundance and vigor. That is why this dish is very popular among businessmen. We gathered around the table with the kids to toss the Yee Sang. We had to make sure we briefed the kids how to toss or else, heaven forbid, they will throw the salad all over the place! They were excited over this alright. However, most of the kids does not like Yee Sang but the adults do. 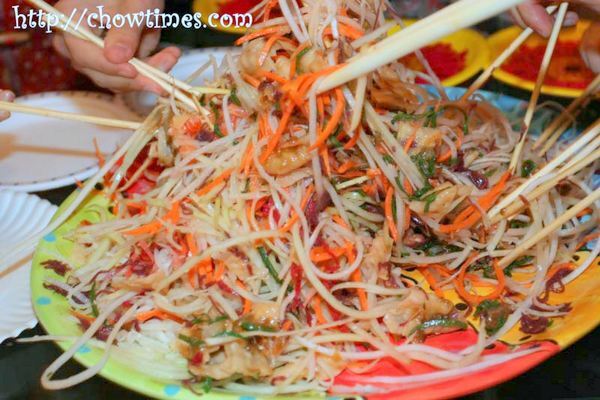 The Yee Sang is characterized by it’s colorfulness. It is served in a large flat platter with vegetables arranged around a small serving of raw fish in the middle. It had been many, many years since Suanne and I have last eaten Yee Sang. So, we were glad when Jess told us she knows how to make it. It looked really good and it smells great too … just like the Yee Sangs I used to know. Minoo made this Armenian Orange Cake while Jenny is busy with her Blueberry Upside Down Cake. 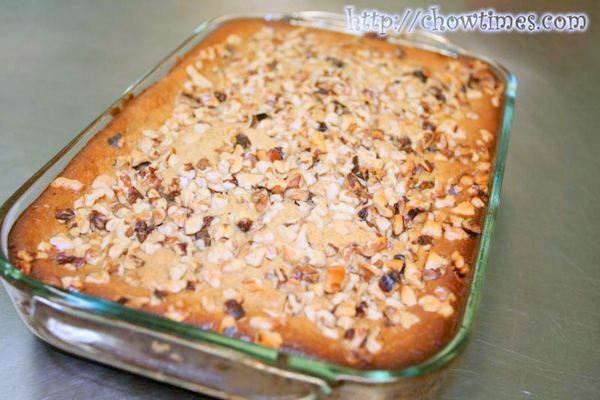 This cake has a very nice crunchy base and a soft and moist cake on top. 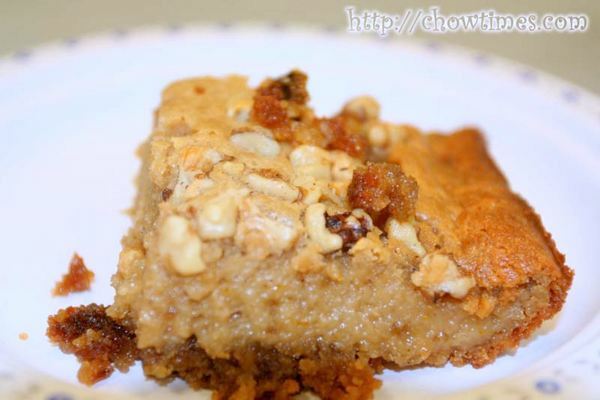 It is also topped with some chopped walnuts which added another layer of crunch to it. I don’t know much about Armenia or the background behind the name of this cake. Anyone knows or could make a good guess? The Armenian Orange Cake is flavoured with lots of orange zest. The citrus flavour just burst in your mouth.